Arizona is considering passing a law that, among other things, would allow a child born in the U.S. to one or two alien parents to be recognized as a “natural born Citizen.” Such a law would be passed in error. Apart from the proposed law being unconstitutional for violating the Supremacy Clause and the Pre-emption Doctrine, a law that recognizes an Article II “natural born Citizen” as including a child born in the U.S. to one or two alien parents would be contrary to what the Founders and Framers designed as a national security safeguard for the Offices of President and Commander in Chief of the Military. In this article, I will address only that part of the proposed law that attempts to define what an Article II “natural born Citizen” is and specifically that part of the law that includes as an Article II “natural born Citizen" a child born in the U.S. to one or two alien parents. In a follow up article, I will address the other parts of the proposed law that I will show are also unconstitutional. Arizona has improperly tied the meaning of a “natural born Citizen” to the 14th Amendment. The meaning of a “natural born Citizen” has nothing to do with the 14th Amendment. The Framers wrote the clause in 1787 and the 14th Amendment was passed in 1868. There is no indication in the text of the amendment, its history, or in any court decision that suggests that the amendment changed Article II’s “natural born Citizen” clause. There is a critical difference between a 14th Amendment “citizen of the United States” and an Article II “natural born Citizen.” “Representatives, U.S. Const. Art. I, § 2, cl. 2, and Senators, Art. I, § 3, cl. 3, must be citizens. Congress has the authority "to establish an uniform Rule of Naturalization" by which aliens can become citizen members of our society, Art. I, § 8, cl. 4; the judicial authority of the federal courts extends to suits involving citizens of the United States "and foreign States, Citizens or Subjects," Art. III, § 2, cl. 1, because somehow the parties are "different," a distinction further made by the Eleventh Amendment; the Fifteenth, Nineteenth, Twenty-Fourth, and Twenty-Sixth Amendments are relevant only to "citizens." The President must not only be a citizen but "a natural born Citizen," Art. II, § 1, cl. 5. One might speculate what meaning Art. IV, § 2, cl. 1, has today.” Sugarman v. Dougall, 413 U.S. 634, 651-52 (1973) (Rehnquist, J., dissenting). All the political and legal battles under the Civil Rights Act of 1866 and the Fourteenth Amendment over who has the right to be admitted to membership in America does not change the meaning of an Article II “natural born Citizen,” for these battles have not been about who are “natural born Citizens” under Article II but rather about who are “citizens of the United States” under those laws. There has never been any doubt in our nation as to who the “natural born Citizens” are. As we shall see below, the U.S. Supreme Court has informed us several time throughout our history that a child born in the country to citizen parents is a “natural born Citizen.” This American common law definition of a “natural born Citizen,” based on natural law and the law of nations, has to this day never been changed by the Constitution, Congressional Act, or the U.S. Supreme Court, and continues to prevail as originally written in Article II by the Framers in 1787. But the 14th Amendment’s “subject to the jurisdiction” clause has never been defined in this manner by our federal courts. For example, U.S. v. Wong Kim Ark, 169 U.S. 649, 708 (1898) found that a child born in the U.S. to parents who were both aliens and who were domiciled and residing in the U.S. and not serving in any foreign diplomatic capacity was born “subject to the jurisdiction” of the United States and therefore a born “citizen of the United States” under the 14th Amendment. Hence, Arizona wants to change the meaning of “subject to the jurisdiction” through an interstate compact. Arizona simply cannot do that, for federal law on the matter is supreme. The Constitution, federal law, and treaties are “the supreme Law of the Land” and therefore trump any conflicting state law. See Constitution Article VI, Clause 2. Such a provision is unconstitutional. "Subject to the jurisdiction thereof" means "not subject to any foreign power." Civil Rights Act of 1866. Hence, it is tied to allegiance. Simply being born on the territory and being subject to U.S. laws is not sufficient, for virtually every child born on U.S. soil satisfies that condition by simply being born on the soil (except for children of ambassadors, invading armies, and American Indians as originally believed). Rather, more is needed. While traditionally, citizenship of the child's parents was needed, Wong Kim Ark changed the law and used domicile and residence of the alien parents as the sufficient link to declare U.S.-born Wong Kim Ark to be a 14th Amendment born "citizen of the United States," not to be confused with an Article II "natural born Citizen." Wong's parents were in the U.S. legally, i.e., with the consent of the U.S. But as far as an Article II "natural born Citizen" is concerned, the natural law/law of nations/common law definition of that term was never changed and prevails today. That definition is a child born in the country to U.S. citizen parents. This provision is designed to allow a child born in the U.S. to be born to different types of parents so that he or she can still be considered a “natural born Citizen.” First, this provision is contradictory. The law would allow a child born in the U.S. to one alien parent to be not only a “citizen of the United States” but also a “natural born Citizen.” If a child is born to an alien parent, then that child acquires through jus sanguinis an allegiance and citizenship in the alien parent’s nation. But this provision says that a person who owes no allegiance to any foreign sovereignty is a United States citizen or national. So first the new law allows not only a “citizen of the United States” but also a “natural born Citizen” to have dual allegiance by being born to an alien parent but then it tells us that a person who owes no allegiance to any foreign sovereignty is a United States citizen of national. These provisions are contradictory. Second, dual citizenship is not prohibited in the U.S. Hence, under the 14th Amendment or Act of Congress, a “citizen of the United States” could be a person who holds allegiance to not only the U.S., but also to some foreign nation. A prime example is Wong Kim Ark to whom the Court gave U.S. citizenship but at the same time recognized that he also had allegiance to and citizenship with China, the nation of his parents. But yet this provision assumes that a “citizen of the United States” does not have any foreign allegiance. Third, Article II also says that “an immigrant accorded the privilege of residing permanently in the United States” owes no allegiance to any foreign sovereignty. This is simply not our citizenship and naturalization law. A person who is an immigrant and has the privilege to permanently reside in the United States is a permanent legal resident (LPR) or what is commonly known as a “green card” holder. This person has not yet been naturalized and is therefore not a “citizen of the United States” under the 14th Amendment. This person is an alien under our citizenship and naturalization laws. It is therefore not possible that this person would not owe allegiance to some foreign sovereignty. Fourth, this provision also says that “a person without nationality in any foreign country” also has no allegiance to any foreign sovereignty. But the fact that someone may have no nationality in any foreign country does not mean that that person has no allegiance to some foreign sovereignty. Simply stated, allegiance and nationality are not the same things. Loss of nationality is a very complex matter and cannot be equated with loss of allegiance without any in depth analysis of all the legal ramifications involved. As we have seen, Article II of the proposed law provides that a “natural born Citizen” is a child born in the U.S. to “at least one parent who owes no allegiance to any foreign sovereignty, or a child without citizenship or nationality in any foreign country.” As can be seen, the new law defines a legal permanent resident (LPR) as having no foreign allegiance. Hence, under Arizona’s proposed law, the child’s parents could both be non-U.S. citizens or one could be a non-U.S. citizen and the child would be included as a “natural born Citizen.” We have also seen that a legal permanent resident is still considered an alien under our law. The proposed law also includes as a “natural born Citizen” “a child without citizenship or nationality in any foreign country,” without any reference to the allegiance and citizenship of that child’s parents. Hence, Arizona would therefore include as a “natural born Citizen” a child born in the U.S. to one or two alien parents. But such a definition of a “natural born Citizen” is in error. Why do we need that the child be born to two U.S. citizen parents? Arizona’s proposed law would defeat the whole purpose of the Framers using the natural law definition of a “natural born Citizen” as the standard to be met by any would-be President and Commander in Chief. There is good reason why the Framers relied upon natural law to provide the definition of a “natural born Citizen.” Under natural law which when applied to nations become the law of nations, a “natural born Citizen” is defined as “those born in the country, of parents who are citizens.” Emer de Vattel, The Law of Nations, Section 212 (London 1797) (1st ed. Neuchatel 1758). Vattel explains that it is “our extraction, not the place of birth, that gives us rights.” Id. at Section 216. We can see that under natural law and the law of nations, it is the condition of the parents that is critical to making a “natural born Citizen.” Hence, when applying the natural law definition of “natural born citizen,” we have to look only to the citizenship of the parents of the child at the moment of birth. But nations pass positive laws regarding citizenship which impact on the allegiance and citizenship of individuals born in and out of their territory. Hence, we also have to look to the place of birth when nations pass such positive laws concerning the citizenship status of its citizens born either in or out of its national boundaries. Vattel explains that those laws must be followed when a sovereign nation passes such laws. Id. at Section 215. Under natural law and the law of nations and how the Framers juxtaposed “natural born Citizen” with “citizen of the United States” in Article I and II of the Constitution, a “natural born Citizen” includes all those born with no foreign allegiance and excludes all those born with foreign allegiance. The purpose of having the natural law national character of “natural born citizen” is to show that a person is born with natural allegiance to only one nation. It was because the “natural born Citizen” status gives a person such a natural character from birth that the Founders and Framers chose that natural law status as having to be the one to be held by a would-be President and Commander in Chief of the Military from the moment of birth. Indeed, it was this national character that for them best kept foreign influence out of the Offices of President and Commander in Chief. No U.S. Court has ever ruled that a person born on U.S. soil to one or two alien parents is an Article II “natural born Citizen.” On the contrary, the only definition of a "natural born Citizen" ever found in any U.S. Supreme Court case is a child born in the U.S. to citizen parents. As authority for this definition, there exists the following cases: The Venus, 12 U.S. (8 Cranch) 253, 289 (1814) (Chief Justice John Marshall, concurring and dissenting for other reasons, cites and quoted from Emer de Vattel, Section 212 of The Law of Nations); Inglis v. Trustee of Sailor's Snug Harbor, 29 U.S. 99 (1830); Dred Scott v. Sandford, 60 U.S. 393 (1857) (Daniels, J., concurring); Minor v. Happersett, 88 U.S. 162, 167-68 (1875) (gives the same Vattelian definition); Ex parte Reynolds, 20 F.Cas. 582, 5 Dill. 394, No. 11,719 (C.C.W.D.Ark 1879) (not a Supreme Court case but persuasive); Ludlam v. Ludlam, 26 N.Y. 356 (1883) (not a U.S. Supreme Court case but persuasive); United States v. Ward, 42 F.320 (C.C.S.D.Cal. 1890) (not a U.S. Supreme Court case but persuasive); and U.S. v. Wong Kim Ark, 169 U.S. 649, 708 (1898) (cites and quotes Minor’s Vattelian/American common law definition of a “natural-born citizen”) and Perkins v. Elg, 307 U.S. 325 (1939) (confirmed that a child born in the U.S. to citizen parents, even if those parents are naturalized U.S. citizens, is a “natural born Citizen”); contra the state case of Ankeny v. Governor of the State of Indiana, 916 N.E.2d 678 (Ind. Ct.App. 2009) (declared that “persons born within the borders of the United States are ‘natural born Citizens’ for Article II, Section 1 purposes, regardless of the citizenship of their parents.” But the court never even raised the issue that there was no proof before the court that Obama was "born within the borders of the United States." In fact, the Ankeny court, while dismissing the plaintiffs' case, never ruled that Obama was "born within the borders of the United States." Nor did it rule that he was a "natural born Citizen." Ankeny mistakenly concluded that the 14th Amendment case of Wong Kim Ark ruled Wong Kim Ark to be a “natural born Citizen” rather than a born “citizen of the United States.” In so ruling, the Ankeny court also incorrectly equated a British "natural born subject" with a U.S. "natural born Citizen" and incorrectly relied upon Wong Kim Ark). There exists no U.S. Supreme Court decision in which any Justice ever said that a "natural born Citizen" is a child born in the U.S. to one or two alien parents. When defining the clause, they said born in the U.S. to citizen parents. In Minor v. Happersett, the whole Court gave us that definition of a “natural born Citizen” which the whole court also confirmed in U.S. v. Wong Kim Ark. "A citizen of the United States, means a member of this new nation. The principle of government being radically changed by revolution, the political character of the people also changed from subjects to citizens. The difference is immense. Subject is derived from the latin words, sub and jacio, and means one who is under the power of another; but a citizen is an unit of a mass of free people, who, collectively, possesses sovereignty. Subjects look up to a master, but citizens are so far equal, that none have hereditary rights superior to others. Each citizen of a free state contains, within himself, by nature and the constitution, as much of the common sovereignty as another. In the eye of reason and philosophy, the political condition of citizens is more exalted than that of noblemen. Dukes and earls are the creatures of kings, and may be made by them at pleasure: but citizens possess in their own right original sovereignty." Id. at 3 (emphasis in the original). So we can see that with the American Revolution, the Founders and Framers abandoned the notion of a British common law “natural born subject” and replaced it with the new “political character” which they called “citizen of the United States,” a concept that had its genesis in natural law and the law of nations. And this latter term, which Ramsay said described a “political character,” had a meaning which was tied to the form of government chosen by the Founders and Framers, that form being a constitutional republic. It had a meaning that would serve the best interests of a constitutional republic to be led by a representative form of government rather than a monarchial one. "None can claim citizenship as a birth-right, but such as have been born since the declaration of independence, for this obvious reason: no man can be born a citizen of a state or government, which did not exist at the time of his birth. Citizenship is the inheritance of the children of those who have taken part in the late revolution; but this is confined exclusively to the children of those who were themselves citizens…." Id. at 6. He added that “[t]he citizenship of no man could be previous to the declaration of independence, and, as a natural right, belongs to none but those who have been born of citizens since the 4th of July, 1776.” Id. And again, “citizenship by inheritance belongs to none but the children of those Americans, who, having survived the declaration of independence, acquired that adventitious character in their own right, and transmitted it to their offspring….” Id. at 7. In referring to birthright citizenship, Ramsay did not use the clause “natural born Citizen.” Rather, he referred to citizenship as a birthright which he said was a natural right. But there is little doubt that how he defined birthright citizenship meant the same as "natural born Citizen," "native," and "indigenous," all terms that were then used interchangeably and all which meant that the child was born to citizen parents. It is also important to understand that Arizona would allow aliens to rear the child who it declares to be a “natural born Citizen.” Aliens become “citizens of the United States” through naturalization which has a very important purpose in the U.S.
“The process of naturalization was specifically designed by Congress to require a foreign national to demonstrate that he or she is familiar with the history, traditions, and institutions of our society in a way that a native-born citizen would learn from formal education and basic social contact. Congress specifically provided that an alien seeking citizenship status must demonstrate ‘an understanding of the English language’ and ‘a knowledge and understanding of the fundamentals of the history, and of the principles and form of government, of the United States.’ 8 U. S. C. § 1423. The purpose was to make the alien establish that he or she understood, and could be integrated into, our social system. ‘Through the system of citizenship classes sponsored by the Immigration and Naturalization Service and the local school system, the alien is aided in preparing himself for citizenship, and every effort is made to give him fundamental and uniform knowledge of our political and social structure. In order that he may intelligently use this fundamental and uniform knowledge and so that he may be a complete and thoroughly integrated member of our American society, the committee [House Judiciary Committee] feels that he should have a basic knowledge of the common language of the country and be able to read, write, and speak it with reasonable facility.’ H. R. Rep. No. 1365, 82d Cong., 2d Sess., 78 (1952) (emphasis added). See also 8 U. S. C. § 1424, which precludes aliens who manifest certain opposition to our society or form of government from being naturalized. An alien must demonstrate ‘good moral character,’ 8 U. S. C. § 1427 (a)(3), which was intended by Congress to mean a broad "attach[ment] to the principles of the Constitution of the United States, and [disposition] to the good order and happiness of the United States." H. R. Rep. No. 1365, supra, at 80. See also 8 CFR § 332b (1973), detailing the cooperation between the Immigration and Naturalization Service and local schools conducting citizenship education for applicants for naturalization. The above is sufficient to demonstrate, I believe, that Congress provided that aliens seeking citizenship status prove what citizens by birth are, as a class, presumed to understand: a basic familiarity with our social and political mores and institutions. The naturalized citizen has demonstrated both the willingness and ability to integrate into our social system as a whole, not just into our ‘political community,’ as the Court apparently uses the term. He proved that he has become ‘like’ a native-born citizen in ways that aliens, as a class, could be presumed not to be. The Court simply ignores the purpose of the process of assimilation into and dedication to our society that Congress prescribed to make aliens ‘like’ citizens. But the justification of efficient government is an even more convincing rationale. Native-born citizens can be expected to be familiar with the social and political institutions of our society; with the society and political mores that affect how we react and interact with other citizens. Naturalized citizens have also demonstrated their willingness to adjust to our patterns of living and attitudes, and have demonstrated a basic understanding of our institutions, system of government, history, and traditions. It is not irrational to assume that aliens as a class are not familiar with how we as individuals treat others and how we expect ‘government’ to treat us. An alien who grew up in a country in which political mores do not reject bribery or self-dealing to the same extent that our culture does; in which an imperious bureaucracy historically adopted a complacent or contemptuous attitude toward those it was supposed to serve; in which fewer if any checks existed on administrative abuses; in which ‘low-level’ civil servants serve at the will of their superiors -- could rationally be thought not to be able to deal with the public and with citizen civil servants with the same rapport that one familiar with our political and social mores would, or to approach his duties with the attitude that such positions exist for service, not personal sinecures of either the civil servant or his or her superior.” Sugarman v. Dougall, 413 U.S. 634, 659-62 (1973) (Rehnquist, J., dissenting). So, naturalization is a process that serves to integrate an alien into American society. It is reasonable to conclude that a naturalized parent would pass to his or her children those values, attitudes, and knowledge acquired during this integration process. By allowing a “natural born Citizen” to be a child born to and reared by aliens, the Arizona law would remove the requirement that the child’s parents be “citizens of the United States” by birth or by naturalization. By not requiring that both of the child’s parents be citizens at the moment of birth, the proposed law would allow a child born to and reared by aliens to be eligible to be President. The Arizona proposed law, in how it defines a “natural born Citizen,” also contradicts Arizona HB 2544, which provides that a candidate for President show by competent evidence that he or she “has not held dual or multiple citizenship and that the candidate’s allegiance is solely to the United States of America.” Clearly, if a child is born to one or two alien parents, under the doctrine of jus soli citizenship, that child will be born with dual or multiple citizenships and not have sole allegiance to the United States. Article VI provides in pertinent part: “B. This compact shall not take effect until the United States Congress has given its consent pursuant to Article I, Section 10, Clause 3 of the United States Constitution.” I do not see any way that the Congress would ever give its consent to any such proposed law which I will explain in a follow up article also contains many other unconstitutional provisions. As we have seen, Arizona’s proposed law would completely change the American common law definition of an Article II “natural born Citizen.” In doing so, it would allow foreign influence to make its way into the offices of President and Commander in Chief and thereby dilute the safeguards for the survival and preservation of the nation that the Founders and Framers gave us through the “natural born Citizen” clause. This proposed law is therefore detrimental to the national security and best interests of the United States in how it attempts to re-define an Article II “natural born Citizen.” This proposed law is not only unconstitutional but also ill conceived as to its merits. As now written, it should be allowed to suffer a quick death. 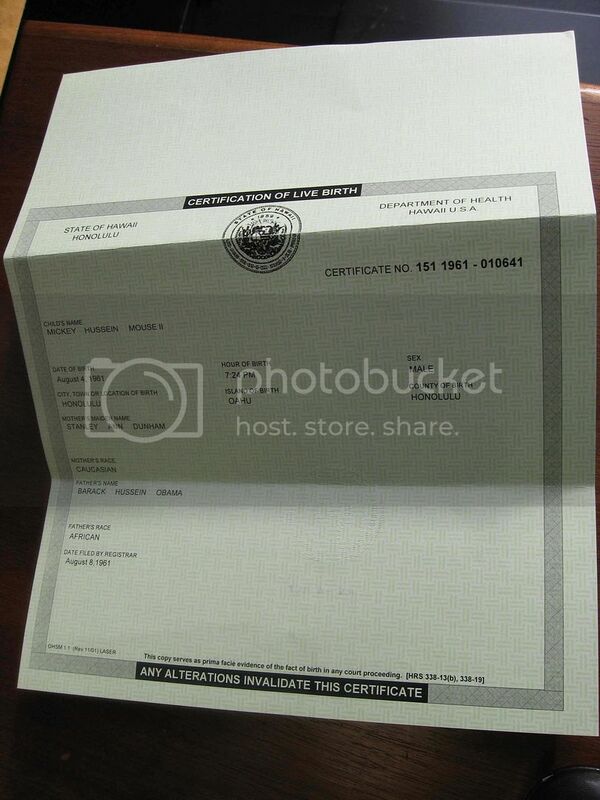 Ad - Obama Ineligible! 21 Feb 2011 issue Washington Times National Weekly edition - page 5. A famous Holmesian dictum provides that "a page of history is worth a volume of logic." New York Trust Co. v. Eisner, 256 U.S. 345, 349 (1921) (Holmes, J.). There have been 43 Americans that have served as President (not including Barack Obama). Ten were born before 1787. Until Martin Van Buren (who was born in 1782 or six years after the signing of the Declaration of Independence) became President in 1837 (making him the 8th president), all the Presidents had been born before 1776 to parents who, undoubtedly, at the time considered themselves to be loyal subjects of one of the British Kings. The president following Van Buren, William H. Harrison (the 9th president), was also born before 1776 to parents who were British “natural born subjects.” All Presidents born before July 4, 1776, were born British “natural born subjects.” Those early presidents were naturalized to become “Citizens of the United States” through the Declaration of Independence and by adhering to the American Revolution. 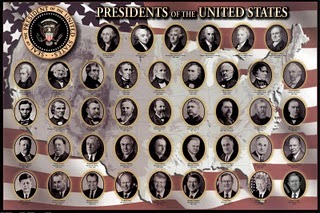 These presidents included Washington, Adams, Jefferson, Madison, Monroe, Adams, Jackson, and Harrison. Article II, Section 1, Clause 5, allowing anyone who was a “Citizen of the United States” at the time of the adoption of the Constitution to be eligible to be President, grandfathered these presidents to be eligible. All presidents born after 1787, except for Chester Arthur and Barack Obama, met the “natural born Citizen” criteria, i.e., born on U.S. soil to a mother and father who were themselves U.S. citizens at the time of the President’s birth. Neither Arthur nor Obama were “natural born Citizens” at the time of birth. Arthur was born to an alien father who also made his U.S. citizen mother an alien. Obama was born to a non-U.S. citizen father who never became a U.S. citizen and, being here only on a temporary student visa, was never even an immigrant. There have been 46 Americans that have served as Vice-President (not including Mr. Biden). Ten were born before 1787. All Vice-Presidents born after 1787, except for Chester Arthur, met the “natural born Citizen” criteria. Fourteen Vice Presidents have gone on to be President. Some believe that John Tyler was our first "natural born Citizen" President. 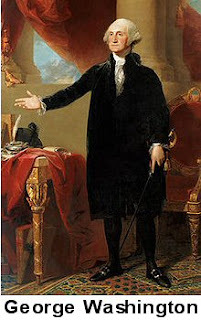 They believe that a President had to be born after the adoption of the Constitution in 1787 in order to be a “natural born Citizen.” Since Tyler was born in 1790 in Virginia, they conclude that he was the first President to be a “natural born Citizen.” I do not agree with this approach to determining who our first "natural born Citizen" President was. The citizens made the Constitution and their government. The Constitution and government did not make the citizens. The citizens had the unalienable rights to life, liberty, and the pursuit of happiness granted to them by nature and their Creator and not by the Constitution or government. On July 4, 1776, our first Americans declared independence from Great Britain and created the new American community of free and independent states. July 4, 1776 is therefore the critical date which established American citizenship. The Articles of Confederation and Perpetual Union, the first constitution of the United States, which went into use in 1777 and which were formally ratified on March 1, 1781, officially recognized the nation as the "United States of America." Hence, all those who helped create the new nation became its members and therefore its citizens. These were the first "Citizens of the United States," which Article II, Section 1, Clause 5 grandfathered to be eligible to be President provided they were born before the adoption of the Constitution. The first President to be born after July 4, 1776 in the U.S. to parents who became "Citizens of the United States" on July 4, 1776 was Martin Van Buren, who was born in 1782 in New York. He was therefore the first President to be a "natural born Citizen." Tyler was the second President to be born under these birth circumstances which makes him the second President to be a "natural born Citizen." Let us now examine how President James Buchanan, who had an Irish father, Woodrow Wilson, who had an English mother, and Herbert Hoover, who had a Canadian mother, were “natural born Citizens.” As we have seen, President Thomas Jefferson, whose mother was born in England, and Andrew Jackson, whose parents were both born in Ireland, were grandfathered to be eligible to be President. Chester Arthur, not being either grandfathered or a “natural born Citizen,” will be treated separately. "The Constitution does not in words say who shall be natural-born citizens. Resort must be had elsewhere to ascertain that. At common law, with the nomenclature of which the framers of the Constitution were familiar, it was never doubted that all children born in a country of parents who were its citizens became themselves, upon their birth, citizens also. These were natives or natural-born citizens, as distinguished from aliens or foreigners. Some authorities go further and include as citizens children born within the jurisdiction without reference to the citizenship of their parents. As to this class there have been doubts, but never as to the first. For the purposes of this case, it is not necessary to solve these doubts. It is sufficient, for everything we have now to consider, that all children, born of citizen parents within the jurisdiction, are themselves citizens." Id., 169 U.S. at 679-80. So as we can see, the Supreme Court told us that a “natural born citizen” is a child born in the country to citizen parents. See also, U.S. v. Wong Kim Ark, 169 U.S. 649, 708 (1898) (distinguished between a “natural born Citizen” and a “citizen of the United States” and cited Vattel and quoted his definition of “natural born Citizen” as did Minor v. Happersett but relied on the English common law to define a born “citizen of the United States” under the 14th Amendment). Under out naturalization laws, citizenship can be derived from a close relation to a family member. Historically, a number of U.S. laws have provided for the automatic naturalization of children or wives (not husbands) of naturalized U.S. citizens. In some periods of our history, these laws provided that married women derived citizenship from their husband and had no control over their status. Under the Act of 10 February 1855, a woman automatically became an American upon marrying a U.S. citizen or following the naturalization of her foreign husband. Kelly v. Owen, 74 U.S. 7 Wall. 496 (1868). The 1922 Married Women's Act (or the Cable Act) finally severed the link between naturalization and marital status for most women. The only exception to all this, apart from Barack Obama, is Chester Arthur. Chester Arthur (1881-1885), was born on October 5, 1829 in Fairfield, Vermont. His father, William Arthur, when eighteen years of age, emigrated from Co. Antrim, Ireland. His father did not become a naturalized U.S. citizen until 14 years after Chester Arthur’s birth. Chester Arthur’s mother, Malvina Stone, was born April 29, 1802 in Berkshire, Franklin, Vermont. Hence, Chester Arthur was born to a father who was not a U.S. citizen at the time of his birth. Because the citizenship of the wife merged into that of the husband, this made Arthur born to an alien mother and father. He was therefore born with dual citizenship of the United Kingdom and the United States. It is believed that Chester Arthur lied numerous times about his past to hide the fact that when he was born his father was not a U.S. citizen and to therefore obfuscate his ineligibility to hold Vice-Presidential and Presidential office. What is most telling is that Chester Arthur also burned all personal records just prior to his death. Chester Arthur was challenged during his Vice Presidential bid on the ground that he was not born in the United States. No one challenged Chester Arthur on the ground that even if he were born in the United States, he was still not an Article II “natural born Citizen” because of his father’s foreign citizenship at the time of his birth which also made his mother an alien. Hence, the Chester Arthur example is not and cannot be treated as any precedent since the nation was not aware of the truth about his father’s and mother’s non-U.S. citizenship status at the time of his birth. Gregory J. Dehler, Chester Alan Arthur: The Life of a Gilded Age Politician and President, Published by Nova Science Publishers, Incorporated, 2006, ISBN 1600210791, 9781600210792, 192 pages; http://naturalborncitizen.wordpress.com/2008/12/06/urgent-historical-breakthrough-proof-chester-arthur-concealed-he-was-a-british-subject-at-birth/. 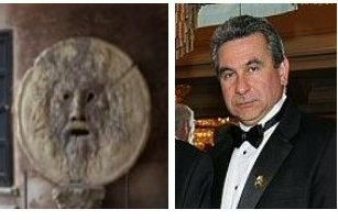 Also see the research done by attorney Leo Donofrio on the Chester Arthur issue which can be found at http://naturalborncitizen.wordpress.com/2008/12/06/urgent-historical-breakthrough-proof-chester-arthur-concealed-he-was-a-british-subject-at-birth/. The Founders and Framers wrote the Constitution in a way that best provided for the protection of our unalienable rights to life, liberty, and the pursuit of happiness. They sought to do that by giving us a constitutional republic and providing for the survival and preservation of that republic. In the governmental scheme that they gave us, they provided for the Office of President and Commander in Chief, a singular and all-powerful office involving the concentration of both civilian and military power into one person. Because of such concentration of power in one individual, the Framers recognized that such offices also presented great risk to the republic and its people. They therefore gave us the “natural born Citizen” clause as one basis for eligibility to such offices. Through the “natural born Citizen” clause, they instructed us that such power must fall into the hands of a person who can be trusted with it to the greatest degree possible and that such guarantee is of much greater importance to the survival and preservation of the constitutional republic than the fleeting politics and personal favor of having one person necessarily occupy that office. What is profound is that the Founders and Framers put their trust in “Nature and Nature’s God” and not in political and legal institutions to accomplish that end. For more information and research on the meaning of an Article II “natural born Citizen,” please see the many essays at this blog, http://puzo1.blogspot.com/. © 2011 Mario Apuzzo, Esq. List of U.S. Presidents - and their Constitutional Eligibility under the U.S. Constitution's Article II, Section 1 "Grandfather Clause (GFC)" or the "Natural Born Citizen (NBC) Clause", or were they seated unconstitutionally due to Election Fraud. Under the Grandfather Clause the person must have been a Citizen of the United States at the time of the adoption of the U.S. Constitution. Under the Natural Born Citizen (NBC) Clause the person must have been born in the USA to parents who were born Citizens of the United States when the child was born. Under the NBC clause it does not matter if the parents were foreign born but only that they both be U.S. Citizens (either born or naturalized) when the child is born in the USA. Both Chester Arthur and Barack Obama were unconstitutionally seated due to Election Fraud and their lying about their respective nativity stories and hiding and destroying their personal early life records. It has been recently discovered that despite the fact the Chester Arthur's father ultimately was a U.S. Citizen, he did not naturalize until after his son Chester Arthur was born. Obama's father was never a U.S. Citizen, never intended to be, was not even an immigrant to the USA nor was he even a permanent resident. Obama's father was a foreign national sojourning in the USA to attend college. Obama's father was a British Subject and at birth Obama was also a British Subject governed by the British Nationality Act of 1948. Obama was thus not a "natural born Citizen" of the United States and is constitutionally ineligible to be President and Commander in Chief of our Military. 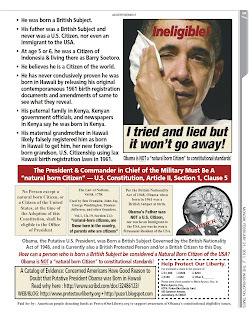 Ad: Obama is NOT a Natural Born Citizen of the United States - 14 Feb 2011 Wash Times Natl Wkly pg 5. 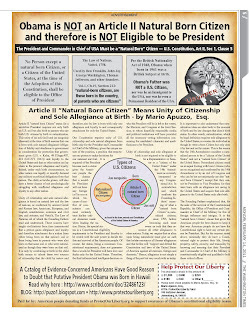 Article II "Natural Born Citizen" Means Unity of Citizenship and Sole Allegiance at Birth - by Mario Apuzzo, Esq. 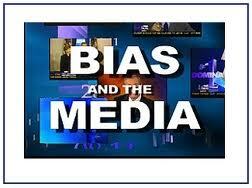 Biased Media Reporting on the Meaning of an Article II "Natural Born Citizen"
Biased Media Reporting on the Meaning of an Article II “Natural Born Citizen,” by Mario Apuzzo, Esq. I just read an article at Multi-American written by Leslie Berestein Rojas on February 8, 2011, entitled, “First Arizona anti-birthright citizenship bills falter in state Senate,” at http://multiamerican.scpr.org/2011/02/first-arizona-anti-birthright-citizenship-bills-falter-in-senate/. The article says: “State Senate legislation in Arizona that sought to deny automatic U.S. citizenship to children born to undocumented immigrants failed to register enough support in a committee hearing late yesterday, leading its sponsor to pull the two bills, at least for now.” The article then says that the Arizona Daily Star reported: “There were also several children who spoke against the bill, including 12-year-old Heide Portugal who said she was born in this country but her parents were not and that a measure like this, had it been in effect, would have denied her citizenship.” This writer did not state her personal opinion as to what type of U.S. citizenship this child has. Second, let us examine the content of the “news” reported in this article. Just the title of the article, “Anti-14th Amendment” tells you what side the reporter is on. Indeed, the reporter is already telling us that what Arizona proposes to do is unconstitutional. More important, the reporter, without telling the reader that it is only his or her opinion, tells us that a child born in the U.S. to alien parents is a “natural born Citizen.” But let us examine the reporter’s “opinion.” If this Arizona child was a “natural born Citizen,” under our Constitution, no government could deny her U.S. citizenship. Neither the States nor Congress nor any court has the power to deny a “natural born Citizen” his or her sovereign citizenship. Let us not forget that the citizens made the Constitution and the government and that the Constitution and government did not make the citizens. That is why the Framers used the term “natural” and called birthright citizens “natural born Citizens” and those who are not “citizens of the United States,” showing that this membership status does not derive from positive law or any government but rather from nature. Since time immemorial, “natural” has always included both the place of one’s birth and the parents to whom one is born. There simply cannot be a “natural birth” with one of those elements missing. For this fundamental reason, American federal common law, which is based on natural law and the law of nations, has always defined a “natural born Citizen” as someone born in the country to U.S. citizen parents. See Minor v. Happersett, 88 U.S. 162, 167-68 (1875) (a “natural-born citizen” is a child born in the country to citizen parents) and U.S. v. Wong Kim Ark, 169 U.S. 649 (1898) (a child born in the U.S. to alien parents who are domiciled here and not working in any foreign diplomatic capacity is born “subject to the jurisdiction” of the U.S. and therefore a born 14th Amendment “citizen of the United States; the case also cited the Minor decision and quoted its definition of a “natural-born citizen”). If someone needs a Congressional Act, treaty, or even the 14th Amendment to be a “citizen of the United States,” then that person is not an Article II “natural born Citizen.” Our U.S. Supreme Court should intervene on the side of any “natural born Citizen” whose citizenship rights may be challenged by any government. On the other hand, when someone is not born a “natural born Citizen,” then Congress can intervene under its naturalization powers granted to it under Article 1, Section 8, Clause 4 of the Constitution. It is then that Congress can create for or deny someone citizenship rights or even impose conditions to be completed after a person’s birth in order to maintain any citizenship status Congress may grant at the time of birth. Since as early as the Naturalization Act of 1790, Congress has exerted its naturalization powers over persons born either in the United States or abroad. Congress’s power over citizenship, however, became limited in 1868 by the 14th Amendment and how the courts interpret that amendment’s “subject to the jurisdiction thereof” clause. Congress has, however, great power under the 14th Amendment which it can exert by defining “subject to the jurisdiction thereof” through Section 5 of that very amendment which allows it to enforce the provisions of the amendment. Also, Congress has great power in matters involving citizenship and immigration under the “plenary power doctrine,” which greatly limits someone’s ability to bring any judicial challenges to Congressional action in this special area. As we can see, our “news” reporting media outlets are real busy taking a stand on the meaning of an Article II “natural born Citizen.” Here we have the “news” reporter adding his or her personal opinion that this child born in the United States to alien parents is a “natural born citizen.” This type of reporting is designed to prejudice the reading public. It should be combated. When we read or listen to “news” reporting, we have to be careful to distinguish what is the reporter’s mere recitation of confirmed “facts” versus what is the reporter’s personal opinion. Persons interested in learning what the meaning of an Article II “natural born Citizen” is should conduct their own independent research so that they can come to their own conclusion based on reasoned study rather than on what someone, including our own government or a court of law, in a conclusory manner tells them it means.